For the last couple years, I've noticed an interesting trend in my brewing: the more experimental the beer, the more I'm going out on a limb from tradition, the more consistently enjoyable my results seem to be. I'm talking a small margin here, but considering that you'd expect experimental brews to be the most hit-or-miss, it's a rather strange discrepancy. Not that I'm brewing each of these beers repeatedly just yet — maybe they'll all prove be impossible to replicate successfully and I'm just a lucky hack — but it seems bizarre to me that my Brett beers always seem to emerge free of off-flavors, while I've had plenty of batches of stuff as simple as a porter come out mediocre. Maybe it's because I don't have as many shining commercial examples to compare my experimental beers to, or maybe I put more passion and attention into the weird batches. Maybe Brett beer and wild ales are more forgiving of some of the technical elements of brewing, like water composition and mash pH — technical considerations that I believe hold many homebrewers back from commercial equivalency and greatness. Maybe I just have very peculiar taste. While I would never tell a brand new fledgling brewer to dive into the craziest experiments first — there's a lot to be said for first building a foundation on classic, widely-understood styles — I also feel that intermediate brewers fear funky experimentation more than they need. Brett is eager to make friends — you just gotta understand how to feed and take care of him. Once again giving credit where credit is due, I owe the inspiration for this beer to Chris Lewis and Shea Comfort. Shea's interview on the Brewing Network from a few years ago remains an insanely fascinating listen, yet for all the clever suggestions he offers for using wine yeast to ferment beer, I was a little disappointed that Brettanomyces never came up. In my original discussion and recipe post, I talk more about why I thought Brett would work so harmoniously alongside the otherwise finicky and murderous wine strains, though I knew it was an idea that could sound entirely sensible on paper and yet come out tasting horrendous. I suppose there's still time to try to scare you off from trying this and pretend it did come out horrendous, but oh well. A few friends have actually told me that I should just skip writing about this beer, or lie and say that it did turn out awful, keeping the methodology to myself. But I couldn't lie to the Internet — I look into the Internet's eyes, and they're so soulful and earnest, how could I? I'm afraid I must be straight with you: this little partnering of unorthodox fermentation agents works perhaps even better than I had hoped for. 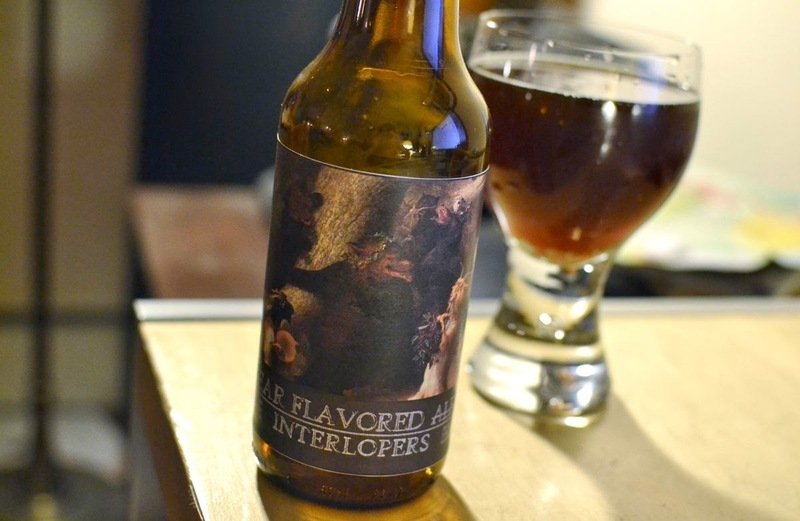 A couple things are going on in Interlopers that I think make it a unique and interesting concept, to me: the overly-complex, vaguely strong ale-ish grain bill gave the yeast plenty to chew on and contrast with, as well as a decently hefty ABV and silky, tongue-coating mouthfeel. (One might even describe it as 'vinous.') The red wine yeast brought the gravity down to about 1.020, as expected — where it stalled out due to its inability to ferment maltotriose. This left a nice chunky meal of pretty much only maltotriose for the Brett to eat, which I believe inspired our friendly wild yeast to produce a bit more flavor and acidity than it would have in a simpler wort. And who even knows what Brett decided to do with all the weird esters from the wine yeast — the first week into fermentation, the carboy reeked of sulfur and damp basements and old socks, but the yeast cleaned up after themselves; all those sulfur compounds giving way to tart cherry and rich berries and plum and exotic, inscrutable stone fruit. I would be remiss not to credit Dmitri (BKYeast) for his excellent Brettanomyces isolates. I used "C1" and "C2" for this batch, isolated from Cantillon Iris, and the aroma off of this is instantly recognizable as that of Cantillon. The particular Brett character comes through much less flavor-wise, where tart fruit dominates, but the aroma on this would just not be the same with your standard commercial Brett B. As much as I love the distinct aroma and the unique vinous presence of this beer, my favorite thing about it might still come down to the flavor balance. I think I just got lucky, hitting my goal this closely. The contrast of the substantial malt base — once rich in sweet residual sugars and still maintaining the presence and viscosity of a bigger, slicker beer — paired against the tartness and tangy fruit that really define the beer now, really make this taste like a young, simpler Flanders Red. Sweet and tart and with hints of cherry, vanilla and oak. The flavor is clear, but approachable; I have a feeling this would appeal to a lot of people without having to compromise on what it was meant to be. I'm a bit shocked how acidic this did get, considering we all know by now that Brettanomyces doesn't really make beers sour, and I have to wonder if maybe the red wine yeast contributed as much as the Brett. It would seem to make sense — maybe wine yeast isn't just adapted to a low pH environment, but contributes to it. There's probably more science behind why this came out the way it did than I have the smarts to dissect. All I know is, I really like it. For the original brew day notes and recipe, click here. Thanks for the kind words and link to my old Porter experiment. While mine was a blend (after separate fermentation's) of 71B and 001, your idea to blend with Brett is awesome. On my brewing calendar I still have my Belgian Dark Strong slated for this Wine to Brett experiment. I'm glad it turned out better than expected. Reading this makes me want to jump into brewing mine. Of course! I'm curious to hear what other's results are, especially if they use different strains. Considering there's a whole spectrum of wine yeast out there, I think there's the potential for some varied takes on this same concept, too. Can't wait to play around with it more myself. The only commercial example I can think of (brett + wine yeast) for this is 'Merica - any idea what order the yeasts are pitched for that? I'd love to try this in a vibrant, hoppy beer with C3 or WLP644 in combination with D-47 (which is reported to aid body in white wines). Interesting... where did you hear that 'Merica was fermented with a wine yeast? I was under the impression it was a more standard saison + Brett combination. Chase will "finish" his farmhouse ales with a white wine yeast to take the gravity down a few extra points to make a bone-dry beer. (source: Basic Brewing Radio interview). The primary strain is his house farmhouse yeast. Ahh, thanks Chris. I listened to that interview the other week but couldn't recall whether he mentioned anything about that. I know a lot of brewers will finish a beer with champagne yeast to dry it out... I haven't quite figured out how that works. From what I understand, champagne yeast wouldn't be able to ferment maltotriose any better than red wine yeast would. And at the end of fermentation, no simple sugar should be left. Great post as I was just thinking about brewing a porter with wine yeast and adding some plums that my tree puts off in the summer. Maybe I'll rethink the recipe and look at finishing it with some Brett. It seems that Brett is more fun to add than Bean-o as they were mentioned on the podcast. 'Merica says that't it's conditioned with two brett strains and a wine yeast. I think they throw the wine yeast in there at bottling to kill any of their proprietary yeast strains that are used in primary but that's just a guess. Brewed a clone recently that came out great. Best beer I've made in five years but definitely not cloned. Oh, that would make sense. Plenty of beers are bottle conditioned with wine yeast (champagne usually), and I imagine that's what they're doing with 'Merica too. I doubt every brewer knows about the wine yeast's killer properties, but covering up their proprietary primary fermentation strains is probably a nice, partially-unintentional side effect. This brew sounds simply amazing. I love the label you made for it, too! Thanks Bryan! I wish it was easier to see the labels in the pictures, I guess I should upload the raw image too. I love how the internet works out, as I was planning to do this with an old ale! What was your pitching rate for the brett? Hey Duncan, sorry for the slow response. Not a terribly high pitching rate for the Brett... I'm relatively lax about these things; I think it was a few hundred ml worth of very loose slurry, so probably 10 - 30 billion cells.